In 2 Nephi 2, Lehi offered the most complete teaching on the Fall found in all scripture. Approaching his own death, as he blessed his son Jacob, Lehi spoke profoundly on the subject of mortality. Questions about the conditions and purposes of human life were of crucial importance at that point in time to all of Lehi’s posterity. While the Book of Mormon offers many unique perspectives on the Fall, there are hints throughout Genesis and the rest of the Old Testament that ancient Israelite prophets understood the Fall’s role in bringing mortality into the world. For example, in Hebrew, Adam means “human” or “humankind,” and Eve means “life,” pointing to how their story was the beginning of human (mortal) life. In addition, several of Lehi’s teachings are similar to doctrines contained in the Book of Moses (Moses 5:11). This has led some researchers to suggest that some of Lehi’s content could have been found or reinforced by his reading of the treasured plates of brass (2 Nephi 2:17). The temple is another place Lehi could have learned additional truths about the Fall, since the themes of creation, fall, and atonement played a role in ancient Israelite temple worship. As Nephi went on to build a temple in the land of Nephi shortly after Lehi’s death (2 Nephi 5:16), it is likely that temple-related teachings provided another important context for Lehi’s final blessings to his sons and grandchildren. As Nephi fashioned his record largely in honor of his father Lehi, the main elements in Nephi’s own writings can be seen also as drawing upon that temple pattern. After the creation of a new branch of Israel (1 Nephi), Lehi’s family received by way of covenant a “land choice above all other lands” (2 Nephi 1:5). For their disobedience, the Lamanites were, like Adam and Eve, cut off from the Lord’s presence and cursed (2 Nephi 5:20–25). Jacob, Isaiah, and Nephi then testify of Christ and the Atonement (2 Nephi 9–30), and Nephi ends by teaching the way of righteousness that leads into the holy presence of God (2 Nephi 31–33). In Nephi’s writing sequence, just before the Lamanite fall comes Lehi’s teachings on the Fall, suggesting a connection between the two events (2 Nephi 2). Lehi taught his children that all mankind inherited ill-effects from the Fall (2 Nephi 2:21), but that opposition was necessary, fortunate, and important (2 Nephi 2:11, 23). 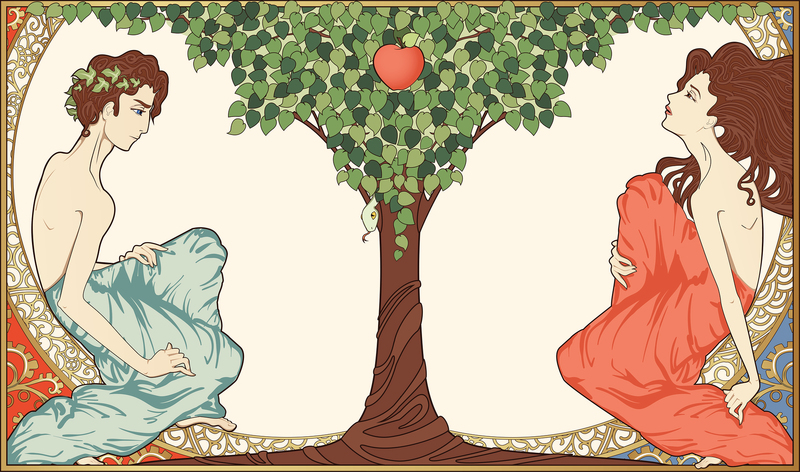 According to Lehi, only through the Fall could Adam and Eve have children (2 Nephi 2:23). He then taught that the Fall was a necessary part of God’s plan which enabled man to be and to experience joy by choosing liberty and eternal life through the great Mediator and not by choosing captivity and death according to the power of the devil (2 Nephi 2:23–27). Lehi taught the importance of the Fall using a parallel statement designed to make a point concisely and powerfully. Some, but not all, of Lehi’s inspiring teachings are evident in other ancient writings. One very ancient, non-Israelite version of the Adam story from before Lehi’s time indicates that Adam’s fall brought death and procreation. Some non-biblical ancient Jewish writings from after Lehi’s time portray Adam positively, as a prominent patriarch and Israelite hero, but most still only take a negative view of the Fall. Beyond these points, much of the context and content for Lehi’s explanation of the Fall came through his own logic, consecrated experiences, and knowledge received through revelation. Lehi’s teachings on the Fall offers all readers a unique and invaluable resource for understanding God’s plan. No other available ancient source, revealed or otherwise, provides all the essential details about the Fall in one place. Lehi’s scriptural explanations, given to Jacob and others still in their youth, present some of the most valuable “plain and precious truths” restored and gathered in the Book of Mormon (1 Nephi 13:26–42). President Russell M. Nelson taught that Lehi’s insight is “a principle for spiritual survival.” How appropriate that such a principle would be connected to the temple. The temple is a spiritual haven and refuge, teaching principles and providing promises essential for survival in this secular age. Fittingly, temples today also teach about the plan of salvation and the central role of the Fall in that plan. First, consider his circumstances: He had been persecuted for preaching truth in Jerusalem and had been commanded by the Lord to leave his possessions and flee with his family into the wilderness. He had lived in a tent and survived on what food could be found on the way to an unknown destination, and he had watched two of his sons, Laman and Lemuel, rebel against the teachings of the Lord and attack their brothers Nephi and Sam. Clearly, Lehi knew opposition, anxiety, heartache, pain, disappointment, and sorrow. Yet he declared boldly and without reservation a principle as revealed by the Lord: “Men are, that they might have joy.” Imagine! Of all the words he could have used to describe the nature and purpose of our lives here in mortality, he chose the word joy! President Dieter F. Uchtdorf likewise affirmed, “We were created with the express purpose and potential of experiencing a fulness of joy.” According to Lehi, only through the Fall could this purpose be achieved for all of humanity. Thus, indeed, all may and will certainly have joy, as Lehi concludes, if they will but choose “the good part” (2 Nephi 2:30). In all of this, Lehi had “none other object save it be the everlasting welfare of your souls” (v. 30). President Russell M. Nelson, “Joy and Spiritual Survival,” Ensign, November 2016, online lds.org. Elder D. Todd Christofferson, “Why Marriage, Why Family,” Ensign, May 2015, online at lds.org. President Dieter F. Uchtdorf, “Happiness, Your Heritage,” Ensign, November 2008, online at lds.org. Bruce M. Pritchett Jr., “Lehi’s Theology of the Fall in Its Preexilic/Exilic Context,” Journal of Book of Mormon Studies 3, no. 2 (1994): 49–83. John H. Walton, The Lost World of Adam and Eve: Genesis 2–3 and the Human Origins Debate (Downers Grove, IL: InterVarsity Press, 2015), 58–62, 74–81. Noel B. Reynolds, “The Brass Plates Version of Genesis,” in By Study and Also by Faith: Essays in Honor of Hugh W. Nibley, 2 vols. (Salt Lake City and Provo, UT: Deseret Book and FARMS, 1990), 136–173; Jeff Lindsay, “‘Arise from the Dust’: Insights from Dust-Related Themes in the Book of Mormon (Part 1: Tracks from the Book of Moses),” Interpreter: A Journal of Mormon Scripture 22 (2016): 179–332. Stephen D. Ricks, “Liturgy and Cosmogony: The Ritual Use of Creation Accounts in the Ancient Near East,” in Temples of the Ancient World: Ritual and Symbolism, ed. Donald W. Parry (Salt Lake City and Provo, UT: Deseret Book and FARMS, 1994), 118–125; Donald W. Parry, “Garden of Eden: Prototype Sanctuary,” in Temples of the Ancient World, 126–151; Walton, Lost World of Adam and Eve, 104–127. Joseph M. Spencer, An Other Testament: On Typology, 2nd edition (Provo, UT: Neal A. Maxwell Institute for Religious Scholarship, 2016), 33–45. 1 Nephi tells the story of Lehi’s family as the creation of a new branch of Israel, and alludes to the original creation, the flood (a re-creation), and the Exodus (the creation of God’s covenant people). See Spencer, An Other Testament, 43–44; Alan Goff, “Boats, Beginnings, and Repetition,” Journal of Book of Mormon Studies 1, no. 1 (1992): 67–84; Terrence L. Szink, “Nephi and the Exodus,” in Rediscovering the Book of Mormon: Insights You May Have Missed Before, ed. John L. Sorenson and Melvin J. Thorne (Provo, UT: FARMS, 1991), 38–51; George Tate, John W. Welch, and Avraham Gileadi, “Research and Perspectives: Nephi and the Exodus,” Ensign, April 1987, online at lds.org. Spencer, An Other Testament, 45. Spencer, An Other Testament, 45, 49, 52–57. See Book of Mormon Central, “What are the Origins of Lehi’s Understanding of the Fall? (2 Nephi 2:25),” KnoWhy (February 8, 2016). Marjo C.A. Korpel and Johannes C. de Moor, “Creation and Fall in Canaanite Mythology,” in The Adam and Eve Story in the Hebrew Bible and in Ancient Jewish Writings Including the New Testament, ed. Antti Laato and Lotta Valve (Turku, FI and Winnoa Lake, IN: Abo Akademi University and Eisenbrauns, 2016), 36, 39, 44; Marjo C.A. Korpel and Johannes C. de Moor, Adam, Eve, and the Devil: A New Beginning, 2nd edition (Sheffield, UK: Sheffield Phoenix Press, 2015), 44–53. This is a Canaanite version of the Adam story from the 13th century BC, and it has a lot of significant differences from both the biblical and Book of Mormon versions of the Fall story. While it is not revealed scripture, it provides context from the ancient world that can help us understand how ancient Israelites might have understood Adam’s fall. Stephen D. Ricks, “Adam’s Fall in the Book of Mormon, Second Temple Judaism, and Early Christianity,” in The Disciple as Scholar: Essays on Scripture and the Ancient World in Honor of Richard Lloyd Anderson, ed. Stephen D. Ricks, Donald W. Parry, and Andrew Hedges (Provo: FARMS, 2000), 595–606. These writings are not scripture, but do provide context that helps us learn about what the ancient Jews knew and understood about Adam’s fall. Endowed from on High: Temple Preparation Seminar Teacher’s Manual, 2nd edition (Salt Lake City, UT: The Church of Jesus Christ of Latter-day Saints, 2003), 1–5. Nelson, “Joy and Spiritual Survival,” online at lds.org. President Dieter F. Uchdorf, “Happiness, Your Heritage,” Ensign, November 2008, online at lds.org. He taught that because it fit life. There were alternatives. Listen closely to the temple word exchange between God and Lucifer. There were other paths other than Lucifer have Eve eat the fruit.